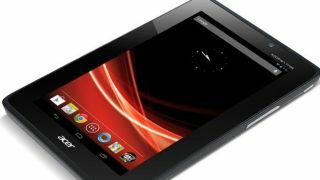 The latest sub-£200 Android tablet to tempt our credit cards, Acer's Iconia Tab A110, has gone up for pre-order in the UK. The 7-inch tablet, running Android 4.1 Jelly Bean, can be reserved at Ebuyer for just £179 - for the 8GB version. The site says it'll have stock within the next 49 days, which fits in our report yesterday slating its arrival in the UK next month (albeit at the very end of next month or the beginning of October). The Iconia Tab A110 boasts a quad-core Tegra 3 processor and a 1024x600 resolution display. There's also 1GB of RAM, a mini HDMI-out and front and rear cameras. There's also a MicroSD card to expand storage, which the rival Google Nexus 7 cannot boast. With those specs, and at that price, the Tab represents a quite stunning bargain, similar to Google's own 7-inch Nexus 7 tablet, which was manufactured by Acer rival Asus. The battle for turf in the budget Android tablet stakes is heating up. Amazon and Google have laid down the markers with their sub-£200 efforts. While Google's offering comes in at £159, Acer's £179 tablet still looks mighty mighty tempting, especially if it arrives, as rumoured, with Jelly Bean out of the box.